YOU MUST PUT “I’m in the GREEN ” in the SUBJECT LINE or the email will not be opened. Have you entered today’s FLASH Giveaways? Don’t miss out…Join us here!! Are you a FLASH GIVEAWAY winner? Checkout our daily winners HERE ! YOU MUST PUT “I’m a Love winner ” in the SUBJECT LINE or the email will not be opened. 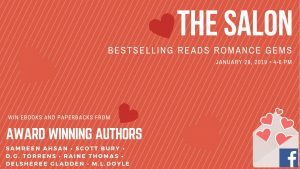 Join us and 6 authors as we celebrate Romance books and reading with a 2 hour fun event full of GIVEAWAYS and FREE books just for you. Don’t forget to enter the GRAND PRIZE rafflecopter for $50 Amazon gift card: Link to come.